Madagascar has a population that is partly Austronesian and partly African in origin. 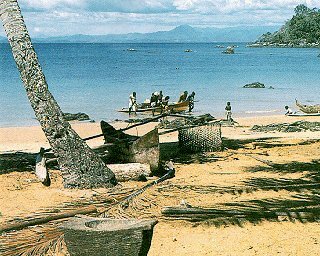 The Austronesian people are descended from the seafarers from South East Asia and Pacific islanders who came to Madagascar about 2000 years ago. Before this time the island seemed to have been uninhabited. Those of African origin are descendants of the people from East Africa who constantly arrived on these shores over the centuries. 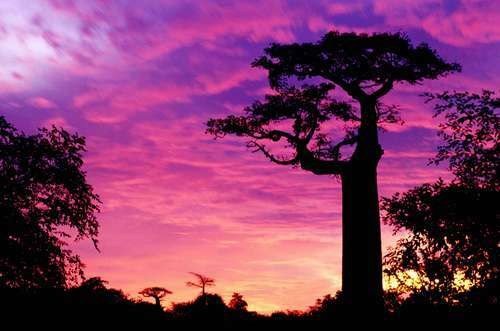 The population of Madagascar is about 20 million. The language seems to have a similarity to the Maanyan language spoken in southern Borneo. 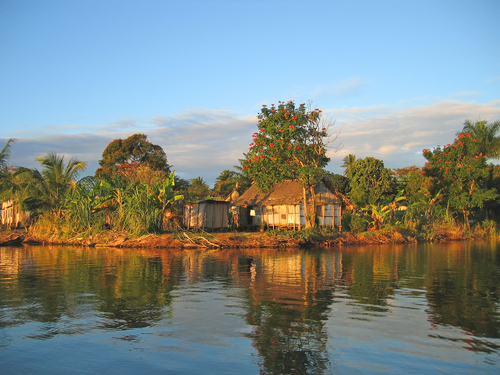 There are also small communities of Chinese, Indian and French people living in Madagascar. Madagascar is an island nation that is separated from the southeastern coast of the continent of Africa by the Mozambique Channel. It is the world's fourth largest island and has a very large population of plants and animals most of which are endemic to the island. The lemur and fossa (related to the mongoose) are two of these besides six baobab species and three bird families. This variety of wildlife has led to it being quite often referred to as the eighth continent. The country is very poor and most of the people live below the accepted poverty line of $1.25 per day. The distance between Madagascar and the African continent is about 248 miles. The present political situation in Madagascar is very uncertain and things have not yet settled down after a coup in March 2009. Agriculture, fishing and forestry are the main pillars of the economy. 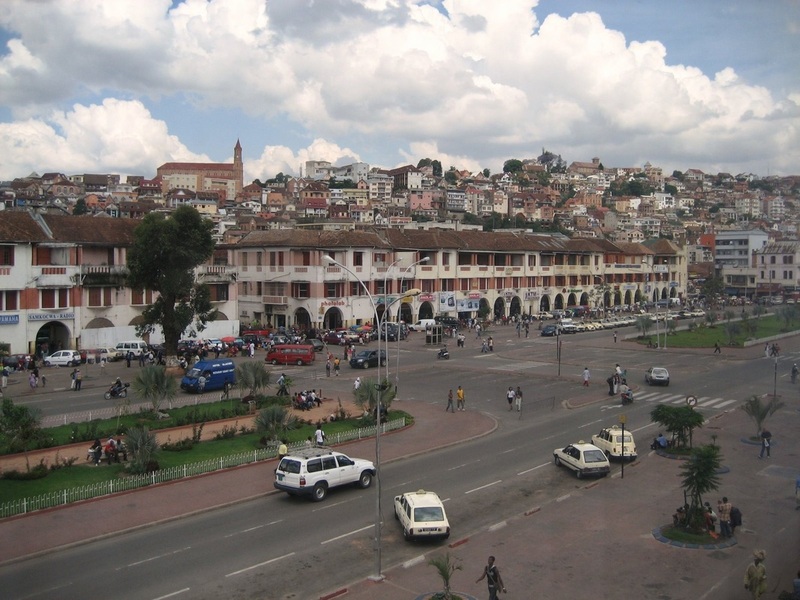 Antananarivo is the capital of the country. The island of Madagascar has an area of 364,745 sq. miles and the highest point in the island is at a height of 9,514 feet. The island also contains 3,418 sq. miles of inland water bodies. It has five distinct geographical regions. The east coast consists of lowlands and an 500 mile long lagoon formed naturally by sands coming in from the Indian Ocean. The Tsaratanana Massif is at the north end of the island and has mountains of volcanic origin. The Central Highlands contain eroded hills, granite outcrops, extinct volcanoes and plains and marshes that have been converted to rice fields. The west coast has sedimentary formations and has a number of fine harbors. The climate varies from tropical along the coast to temperate or arid as you go inland. The trade winds from the Indian Ocean dominate the climate with rains from November to April. The Arabs established trading posts with the populace of the country that was mainly Austronesian or African. The island became a French protectorate in 1890 and gained independence from that country in 1960. Marco Polo may have named Madagascar, but the true derivation of the name is not clear. Bantus and Arabs began to settle in Madagascar after the civil wars that followed the death of Mohammed in 632. The Sakalava chieftains dominated the country until the Europeans came and started dominating the trade before colonizing the island. It was also a stronghold of the pirates of the Indian Ocean in the 17th century. 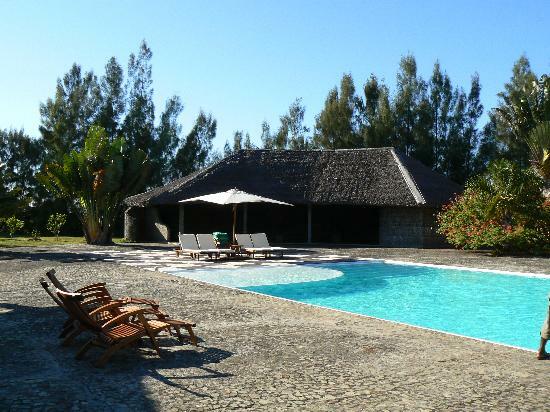 Nossi Be is the most popular of all the resorts in Madagascar and is a small island surrounded by a lot of smaller islands off the northwest coast of Madagascar. Perfume plants like vanilla, ylang-ylang, lemon grass and patchouli are grown here and the island has a ruined 17th century Indian village. Another popular beach resort is Mananjary on the east coast where there are also many orchids and carnivorous pitcher plants. This was also the first French settlement and has remains of a fort from the 17th century. There are a number of National Parks that are great for sightseeing where you can see a lot of undisturbed forests, a number of endangered birds, and the lemur that is endemic to Madagascar. The Manbambolo River gorge is an area worth visiting. The south of the country can be visited to see the variety of cactus and baobab plants as well as the elaborate funerary art of the local populace. The nightlife in Madagascar is unique because of the bands and solo musicians that can be found in most clubs and restaurants. There is also a casino in the capital Antananrivo and a few other cities. Theatres and cinemas are also part of most city scenes where you can catch traditional dance performances or see the latest Hollywood movies. If you feel like going on a night safari, this is the easy way to spend the night in Madagascar while you view the lemurs that seem to be active only during the night. Nightclubs in Madagascar are well patronized by the younger crowd from the local population as well as international tourists, and the music is well suited to both tastes. 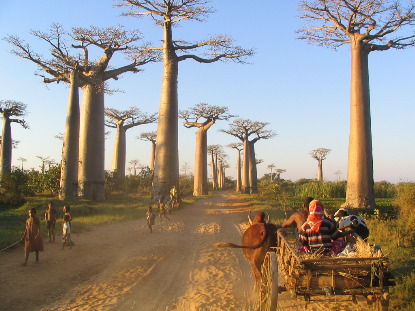 Madagascar has eighteen tribes, but the culture of all of them is almost the same. There is a great respect for ancestors who are considered gods. Magicians are always at the center of most ceremonies. The musical heritage of Madagascar is distinctive and rich. There has been a tradition of oratorical ways of handing down stories and epics with some of them being centuries old. Zebu or humped cattle are said to represent the wealth of a family. More than half the population of Madagascar practices traditional religion that centers on ancestors. Over 40 percent of the population practice Christianity. Smaller groups in the country also practice Islam and Hinduism. The traditional meal in Madagascar is rice accompanied by some other dish called laoka. Rice can be supplemented by maize that has been dried and ground. A traditional stew made with rice is vary amina nana, made with rice, meat, and greens. Ingredients in laoka vary with whatever is available during the season. This could include bean and pork combinations, or even fish or dried strips of zebu. Cassava leaves are also used with peanuts or pork, and tsaramaso, beans in tomato sauce, is served as a side dish. Garlic, onions, ginger and tomatoes are used in all dishes while some coastal areas could use coconut milk, vanilla, cloves or turmeric. Spicy foods are not very common though satay or achar (an Indian pickle) may be served. Achard is a salad of green beans, cabbage, carrots and onion in a vinaigrette sauce and is quite often a side dish also used as filling for sandwiches.